Two sensational unsolved crimes—one in the past, another in the present—are linked by one man's memory and self-deception in this chilling novel of literary suspense from National Book Award finalist Dan Chaon. "We are always telling a story to ourselves, about ourselves." This is one of the little mantras Dustin Tillman likes to share with his patients, and it's meant to be reassuring. But what if that story is a lie? A psychologist in suburban Cleveland, Dustin is drifting through his forties when he hears the news: His adopted brother, Rusty, is being released from prison. Thirty years ago, Rusty received a life sentence for the massacre of Dustin's parents, aunt, and uncle. The trial came to epitomize the 1980s hysteria over Satanic cults; despite the lack of physical evidence, the jury believed the outlandish accusations Dustin and his cousin made against Rusty. Now, after DNA analysis has overturned the conviction, Dustin braces for a reckoning. Meanwhile, one of Dustin's patients has been plying him with stories of the drowning deaths of a string of drunk college boys. At first Dustin dismisses his patient's suggestions that a serial killer is at work as paranoid thinking, but as the two embark on an amateur investigation, Dustin starts to believe that there's more to the deaths than coincidence. Soon he becomes obsessed, crossing all professional boundaries—and putting his own family in harm's way. 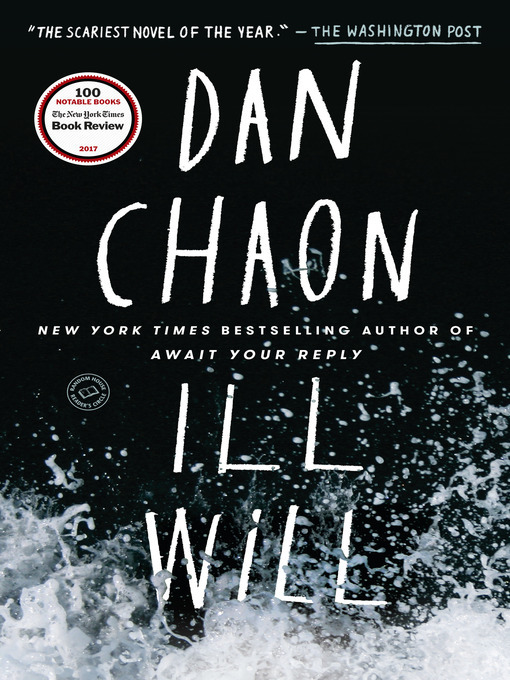 From one of today's most renowned practitioners of literary suspense, Ill Will is an intimate thriller about the failures of memory and the perils of self-deception. In Dan Chaon's nimble, chilling prose, the past looms over the present, turning each into a haunted place.